Even though Bussorah Street is home to many popular and interesting halal restaurants, I’ve yet to find the chance to explore this part of Singapore. I know the area gets pretty crowded in the evening, especially during the weekend with families & friends gathering over food and drinks. Just last weekend, I finally had a satisfying brunch at a hidden gem within the area and it is none other than the beautiful halal Italian restaurant – Positano Risto. So, you must be wondering what’s so special about it? There’s plenty of Italian restaurants in Singapore but there’s only that few (can count with one hand) that offers good halal Italian food, and Positano Risto is definitely one of them. 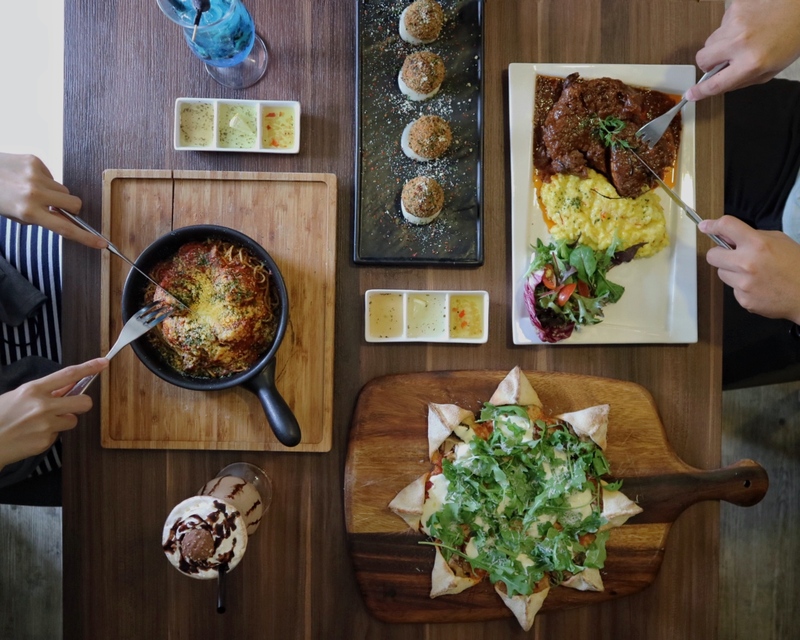 Recently, they welcome a brand new menu and I’ll be sharing some of their signature dishes in this article. So, if you’re looking for a nice place to have your meal this weekend, you should totally check Positano Risto out! P/s: They have a second level in the restaurant and if I were you, I would call and reserve a table upstairs! I really love the drinks here because they are HUGE! With the weather being so hot these days, this drink came just at the right time! Chocolate-lovers will fall in love with it instantly because it was full of Ferrero and Nutella flavour but not too overwhelming (not jelat). Wiped this all out (me alone) in no time! This was very refreshing with a good sweet-sour combination. Don’t get intimated by the colour because this was not overly sweet! I didn’t expect these Italian Brown Rice Balls stuffed with Mozzarella to taste that good! Fried to perfection, they were very crispy and the cheese just oozed out with a gentle slice. Oh yes, that secret sauce at the bottom complemented the balls really well. So good I didn’t want to share with my friend. Initially I was very intimidated by the presentation of the veal shank but everything changed when I took a small bite. It was well-cooked, flavourful and not gamey at all. The meat was very tender, and the sauce was such a great complement. Oh yes, if you’re wondering if the yellow patch on the side is scrambled eggs, they are not. They are actually risotto which goes really well with the sauce. Highly recommended! The pasta was well-cooked with bolognaise sauce but I thought it was a tad too salty for me. Meatballs were really flavourful but a pity, it was a tad salty as well. Don’t get intimidated by the veggies on the pizza because this signature pizza was DARN GOOD! The thin crust was super crispy, fillings were just right (turkey ham and pepperoni strips) and the burrata cheese was ?. I’m definitely ordering this again during my next visit! Okay, this was the perfect dessert to end our hearty brunch. It has a nice layer of crisp on the top and the brownie was soft and melty. Paired with a classic Vanilla Ice Cream, this dessert is to die for! Personally, I thought this was not too sweet (probably because I have a really strong sweet tooth). Oh yes, portion is really big too! Previous PostBeast & Butterflies: Where Creativity Never Ends; with New Rojak Ice Cream Toast?!! Next PostWhat To Expect At Singapore Botanic Gardens Heritage Festival This Year?